It is difficult to settle terms when discussing the body in performance. Is the body subject, object, medium, site? Is the body lived, inscribed, constructed? How do we think about the body of the artist in relation to the individual and collective bodies of the audience? How does the body in performance create and critique these relationships? Adam Electric’s Tomb, Jamal Harewood’s The Privileged, and Cassils’s Inextinguishable Fire are differently conceived and produced performances that invite degrees of participation. Making varying demands of their audiences, they provoke questions about the relationship between the body of the performer and the accountability of the audience. Tomb is both performance and installation. Electric and four other performers stand on a thin semi-circular platform, their bodies enveloped in white latex. Electric inhales air from inside the latex ‘tomb’ and exhales through a breathing tube, slowly smothering the performers’ bodies in the vacuum. The audience must fix our gaze on the bodies of the performers, must listen to the increasingly desperate sounds of gasping, sucking, aching for breath. We must pay close attention to the breathing tubes and the bodies, and prepare to act if the tubes become obstructed and the bodies convulse or go limp. The terms of participation vary for each member of the audience: how closely we look, how sensitively we listen (some of us may even breathe empathetically, our hearts pounding in time with Electric’s). The Privileged is a participatory performance. The studio is arranged to resemble an animal enclosure: fifty chairs are arranged in a large rectangle, while Harewood, dressed in a polar bear costume, ‘sleeps’ in the centre. Ten envelopes have been placed on the chairs. An audience member opens and reads aloud the first envelope, in which the zookeeper apologises for his absence and provides instructions for encountering the polar bear. The audience, or visitors to the zoo, are instructed to self-facilitate the performance, or encounter. Instructions range from playing with the bear, to feeding the bear, to unclothing the bear (that is, removing the white costume to expose Harewood’s naked black body). Harewood asks the audience to work together to generate events: as polar bear and absent zookeeper, he enables the encounter; as artist, he stages confrontation. He describes his work as creating ‘temporary communities through participatory events’, which raises questions about the nature of communities and the matter of performance. If we do not work together, or if we refuse to participate, what happens? Furthermore, who is responsible for what happens: the audience members who act, the audience members who do not act, or the artist who creates the work (and, arguably, creates the audience)? Inextinguishable Fire is a live performance and film of a fire stunt, the former taking place in the National Theatre, the latter projected onto the outer wall of the Royal Festival Hall. 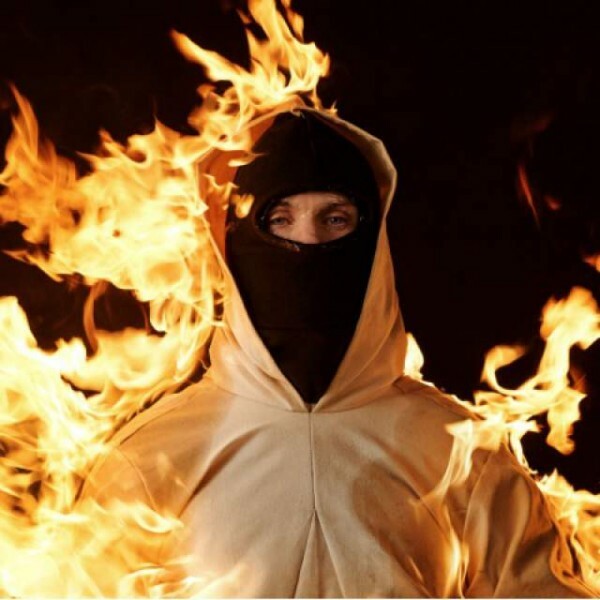 Working with a team of stunt coordinators, Cassils’s body is swaddled in protective clothes soaked in ice-water, doused in petrol, and set alight. Cassils burns alive for 14 seconds, before falling to the ground and being extinguished by the team. Following the performance, the audience moves out of the theatre and into the public space to watch a film in which the 14 second fire is extended to 14 minutes as the camera zooms outwards in slow motion, emphasising the staging and visual effects of the stunt and the contemporary mediation of violence. In the live performance of Inextinguishable Fire, the presence of stunt coordinators and fire extinguishers may assuage the audience’s obligation to intervene, but that does not release us from the pressure of witnessing. We are bound by our decision to experience the artist’s risk and corresponding fear, and by the shame of our appetite for horror. In each of these performances, the relationships between artist and audience are confused by the unstable dynamics of art and life. Do we think of ourselves as spectators, participants, performers, agents? If social and political structures are reproduced in the artworks, how do we understand our positions in relation to oppression, inequality, and violence in the world? In a post-performance discussion of The Privileged, members of the audience attempt to articulate the moment at which things started to go wrong (there is a sense that the performance stopped when something unsavoury started, when art descended into real life). As we make claims for ourselves – I felt uncomfortable when I heard the first instruction; I felt uncomfortable when the second shoe was removed; I felt uncomfortable when I noticed that other people felt uncomfortable – we absolve ourselves and bring moral charges against others. The audience debates whether or not this is a safe space for open discussion, but it is possible that safety is not Harewood’s concern. Risk is built into each of these performances; the artists take risks with their bodies, art practices, and relationships with the audience, and encourage the audience to take risks with aesthetic and ethical experience and judgement. We are confronted with our own beliefs and reactions to the status, value, and consequence of art. Audience accountability may be relative to the contexts within which these performances take place. We understand that Spill is a festival of radical live performance (the programme includes the disclaimer: ‘Spill questions traditions of art and society. The festival contains work that may be challenging to some people’). We spend time and money in attending performances, and carry certain expectations of what we should receive in return. We enter venues, and consciously and unconsciously absorb information about culture, the arts, access and security, and etiquette. We are rehearsed in applause, however inappropriate or insincere, clapping in acknowledgement that the performance is concluded, that the artist is alive, that the audience is released from responsibility. These risks and responsibilities, that we seek after and regret once acquired, demonstrate the reciprocal nature of privilege and burden.